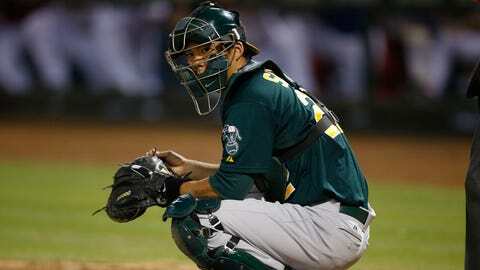 Veteran catcher Kurt Suzuki hit .232 with five home runs and 32 RBI last season with the Athletics and Nationals. MINNEAPOLIS — The Minnesota Twins have found their veteran catcher. According to multiple reports, including FOX Sports’ Ken Rosenthal, the Twins have reached an agreement with Kurt Suzuki on a one-year deal, pending a physical. Suzuki spent the majority of his seven years in the majors with the Oakland Athletics, while also playing for the Washington Nationals for a combined 122 games in the 2012 and 2013 seasons. Rosenthal says the deal is for $2.7 million plus incentives. With Joe Mauer making the transition from catcher to first base, Minnesota needed catching depth — and a veteran catcher, at that — after trading away Ryan Doumit to Atlanta on Thursday. The Twins think highly of 24-year-old catcher Josmil Pinto, who debuted this past season, but heâs still a bit raw defensively. Suzuki hit just .232 with five homers and 32 RBI last season for Oakland but was solid behind the plate. The 30-year-old Suzuki has played for the A’s and Nationals in his seven-year career. He is a career .253 hitter with 67 home runs while throwing out 26 percent of attempted runners. Prior to the acquisition of Suzuki, the Twins had 39 players on their 40-man roster. A move will have to be made eventually when the re-signing of pitcher Mike Pelfrey becomes official.